Teflon Vials for Precise C-14 In Benzene Measurements by LSC Technique. Teflon, as material, is well known for its high performances: chemical resistance, mechanical durability and optical transparency (ultra-violet). All it makes possible its application for liquid scintillation counting especially for radiocarbon dating based on application of modern LS spectrometers like Quantulus 1220. It is very important to use Teflon vials for Liquid Scintillation Counting to optimize Conventional Radiocarbon Dating. Teflon vials, at beginning, was developed for large volume, at least 7.0 ml or 3.0 ml of benzene. After that Teflon vials was developed for measurement of small benzene samples about 0.3 ml. Each measurement performed on base of Liquid Scintillation Counter (LSC) utilizes LS vial. Different applications of LSC technique are covered by different kind of LS vials. LS vials are produced using of different materials like: glass, polyethylene, boron-silicate glass and Teflon. Most powerful are Teflon vials. 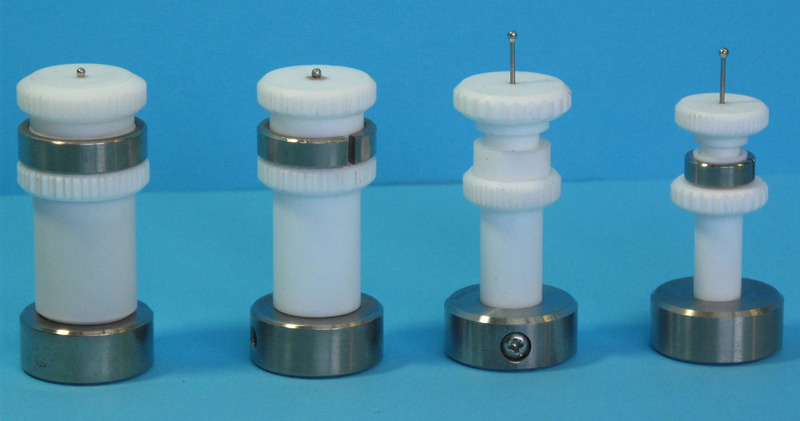 Traditional Teflon vials, which are applicable for LS benzene counting for radiocarbon dating, as produced by Perkin Elmer Inc. are 7.0 ml and 3.0 ml (first two on left at a photo right). Like other, on photo, at right, are presented three different holders containing 0.8 ml vial to fit in standardized size, see description below. 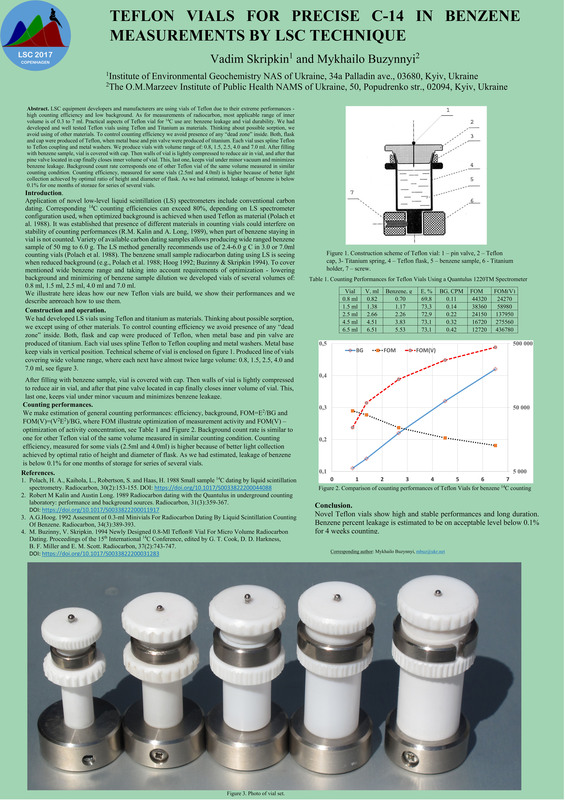 Small size Teflon vials of 0.8 ml was designed to cover range of sample volume between 0.3 and 3.0 ml and was published: Newly Designed 0.8-ML Teflon Vial for Micro-volume Radiocarbon Dating. (1995). Teflon as material of vial applied and size define counting performances of vials. Working cycle depends on number of parts used and on additional materials involved: metal, rubber and Teflon film. Thus version B here is more suitable for continuous use. Small 0.8 ml vial fits into row of vial volume of 7.0 ml and 3.0 ml and could be standardized with different holders. It also fits into line, which describes FOM - main counting performances of Teflon vials (counting efficiency and background), see, bi-logarithmic scaled plot at picture right(down). Two versions of an 0.8-ml volume Teflon vial for benzene counting aiming radiocarbon using a modern Quantulus 1220 liquid scintillation spectrometer, see picture below. Counting efficiency for C-14 was achieved up to 82% against a background count rate of 0.1 CPM, i.e., a "figure of merit" (FM) value = 67,240. Teflon vials of Modern concept developed recently differs, see photo (right). It allows long durability due to avoiding of use of screwed connection of Teflon parts. Vials use spline coupling and metal washers. They have better performances: hermetic vials have neglible benzene leakages ever. 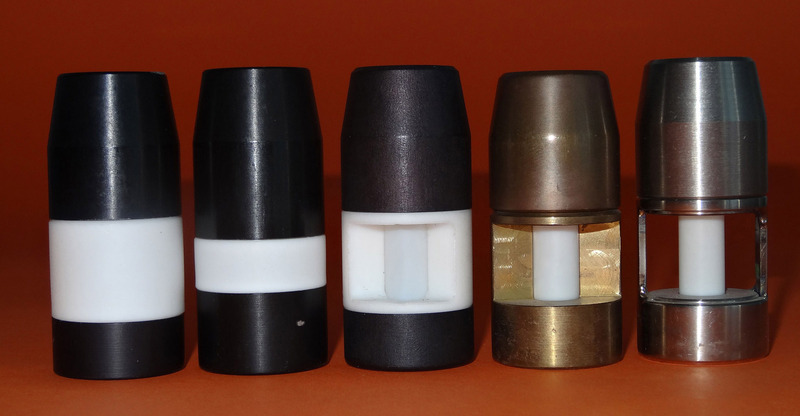 Standardized benzene sample volume could be ranged (bold presented on picture): 7.0 ml, 4.5 ml, 3.0 ml, 2.5 ml, 1.5 ml, 1.0 ml, see Teflon vials gallery. Vadim Skripkin, Mykhailo Buzynnyi. Teflon Vials for Precise C-14 In Benzene Measurements by LSC Technique. LSC-2017 - an International Conference on advance in Liquid Scintillation Spectrometry, 1-5 May, Copenhagen, Denmark. Book of abstract. p.72.